Beautiful view. Great walking area. Easier to access than other mountain cabins weve stayed at. Comfy beds. Had everything we needed. This cabin an excellent place to stay. It is very nice and clean. GPS will take you to the cabin so that was an add bonus. It is quiet and the view is worth the drive up the mtn. Beautiful, super clean, scenic, and super comfortable! Can't wait to return! We had a really great time enjoying the Fire Pit. Luckily, no bears came and joined our Smores session! Loved all the beautiful views and cannot wait for our next trip to the mountains. Our first family vacay to Bryson City! OMG! the beautiful cabin, the views and just being together. Can't wait to come back in the winter. Hoping for snow. We hope that your stay here is a amazing as ours was. Words can't describe what a beautiful setting! Our family had an unforgettable, amazing time. Views were absolutely amazing! Great fun for kids and local attractions! The cabin, views, attractions, everything was better than expected. It was a beautiful setting and I love the cabin so much. A wonderful time in this beautiful cabin. Thank you for opening up your cabin. The best team ever! I've booked several cabins with them and it's feels like talking to family. House awesome, everything was clean and as described. Wouldn't hesitate to stay again. Your office staff were very responsive and the one issue we had with the missing DVD control was quickly resolved. We had a family gathering with folks from Ohio and Vermont and this place was by far the best place we have ever gathered. Awesome view of the mountains, great decks with hot tub, comfortable chairs, and ample eating areas inside and on the deck. Lots of space in the bedrooms, living area, and bathrooms plus a fully stocked game room. Whether on the deck with a morning coffee or having a late dinner watching sunset you will love this place. What a breath of fresh air. This was our first time visiting Bryson City and the TN area and we loved it! 10 of us came to celebrate our friends 40th birthday. This cabin was perfect. This was the perfect weekend. We will all be back. The Erbse, Breece, Husted family had a wonderful family reunion here! What a terrific cabin! Kelli Hoy & Cathie Wenger were very helpful in answering my questions. This place is amazing. A couples getaway we will remember always!! Very spacious,nice, and clean. Will be returning very soon! The staff was always so helpful with all questions that I had. They were great to work with. Fantastic views - changing constantly with the sunlight and clouds above and below us. 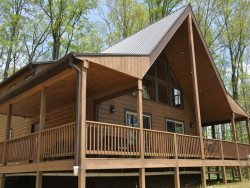 Cabin was ideal for our family of parents, kids and grandkids - plenty of hiking and sites nearby, and enjoyed day trips to Gatlinburg Aquarium, Cades Cove in the GSMNP, and the Biltmore in Asheville. The cabin had everything we needed, was clean and comfortable. Hot tubbing in the clouds was invigorating. Hope to come back and would highly recommend for others.